In the Thursday opening keynote at #DATA14, Dr. John Medina discussed some incredible insight about how sleep affects our brains, productivity, etc. This made me think about this visualization from New York Magazine that I use when I teach data visualization. I use this example in the constructive criticism part of the class. The background shading of the night time and day time. The curved nature of the display, which makes people on the outside appear to sleep longer than those on the inside. The pictures of only some of the people aren't necessary. There's no apparent order to the people. Those are just a few of the most immediate problems. I thought I would show two examples of how I would make this over. In every class that I've taught, the class comes up with something very similar. First up is a Gantt chart view. This view is ordered by the most sleep to the least sleep and color-coded by those that get at least eight hours of sleep (the minimum amount according to Dr. Medina). NOTE: I added the background shading from 10pm-6am after the original post based on feedback from Steve Wexler. 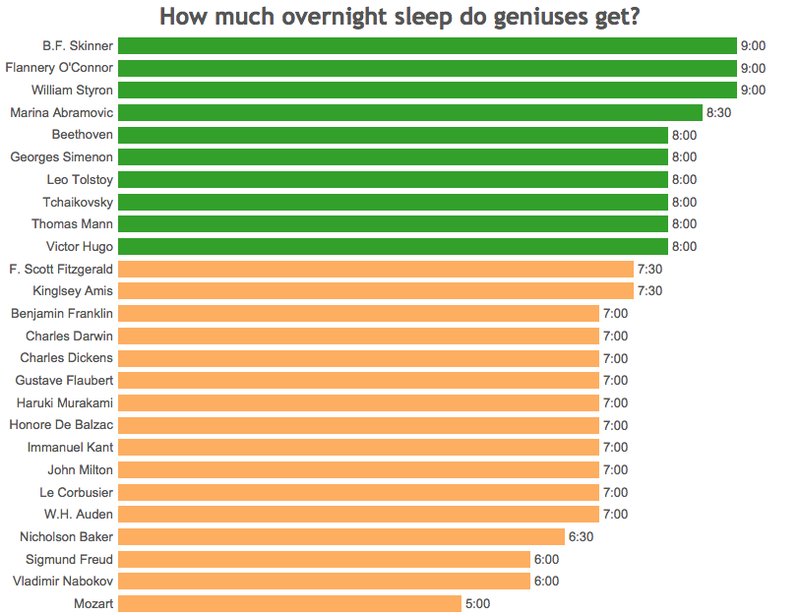 If you'd prefer not to see it in a timeline view, but rather by a simple list from the most sleep to the least sleep, this bar chart would likely suffice. If you'd like to create an alternative view of your own, you can download the Tableau workbook here and/or the data here. 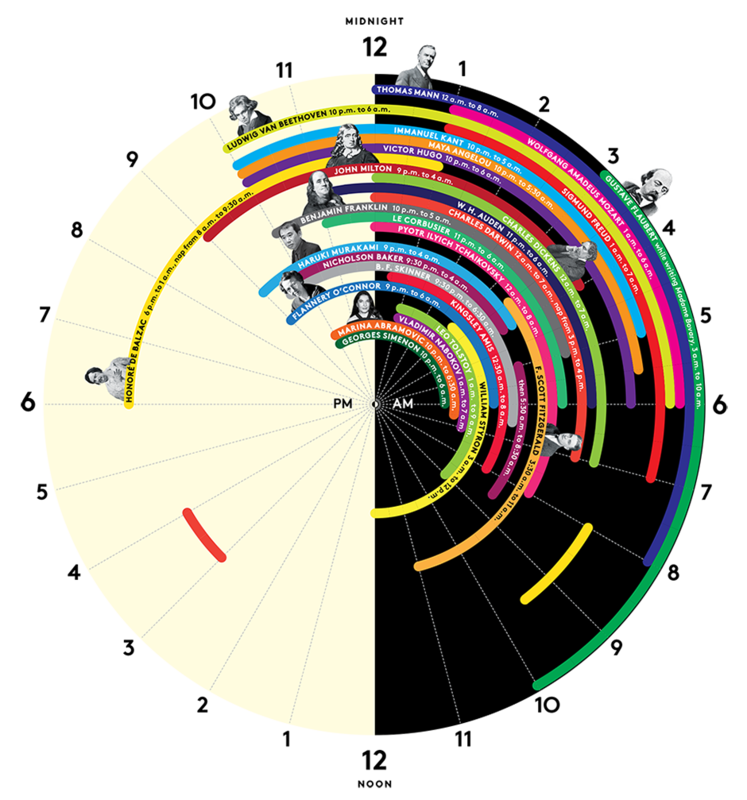 I think the data for Beethoven might be off though - the infographic has his sleep time from 10 pm - 6 am, not 8 am. Thanks Tim for catching that! I've fixed it. This is what happens when I have to manually recreate the data. Andy - I couldn't resist this one. I published a "pseudo-scattersplot" using Sleep Hours and Bed Time. It is "pseudo" because Bed Time is a discrete dimension, the only good way I could find to make sure that all of the names were displayed. 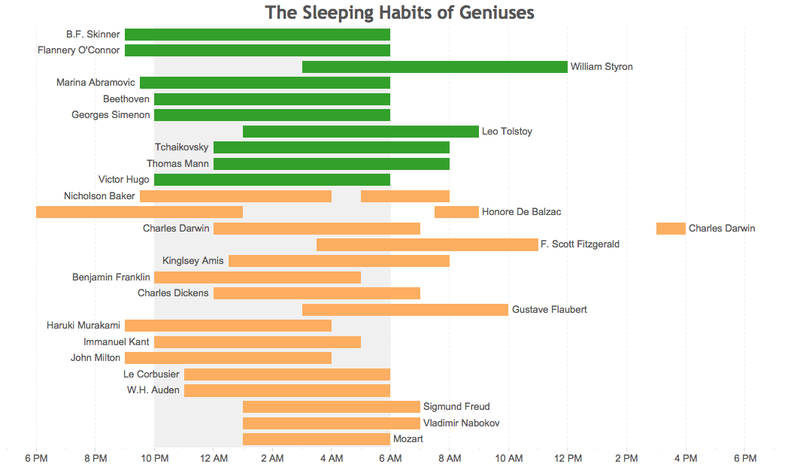 Some really interesting outliers - Mozart (a machine), Balzac (the laziest) and Beethoven (can still be a genius on 10 hours of sleep). Hi, is this workbook still available?